Inspite of winning three titles; Champions League, Club World Cup and European Super Cup, James’ 2016 was not the best on a personal level. However, unless the player insists publicly and privately that he wants to leave, the will of the club is firm: wait until June 30 or refer to the 500 million euros termination clause. The 25-year-old started the year in the worst possible way, pursued by the Police to Valdebebas on January 1, because of driving very fast. Then, Zinedine Zidane’s arrival did not work out for him as he had hoped. Although the Colombian confessed the Frenchman was his idol, the new coach only saw him as a substitute. Inevitably the distance between the two grew, the player left out for the Champions League final and the Club World Cup too. 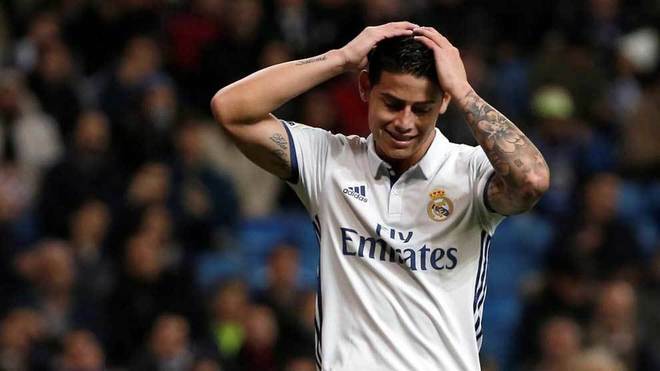 Thus, James’ situation is posing a problem for the club because they don’t want to sell him in the winter transfer market, nor do they want a conflict which will upset the team harmony. The truth is that the solution isn’t a simple one and a move would break the strategy that Jorge Mendes has in place. By having gone public recently with his displeasure, the distance between coach and player is even greater than it was before, bringing James’ 2016 to a disappointing end. Just how his year had started. Twelve months in which his star has rarely shone.